This is a basic test for embedded SVG fonts. The font "Comic Sans" (available from Microsoft) has been converted into an SVG font and embedded in the SVG file. The test contains two text areas, each with the character string "AyÖ@ç" drawn at the same font size. 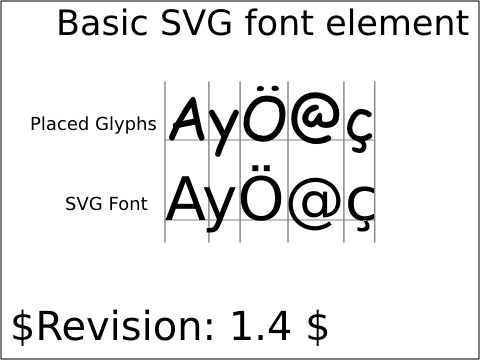 The upper area contains the glyphs from the embedded font placed in the SVG file as path elements. Each glyph is placed at the location it would be if rendered using normal text rendering (ie. the horizontal advance between characters has been preserved). 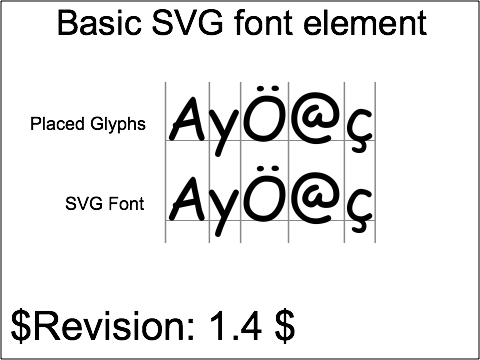 The lower area contains the text string rendered using the embedded SVG font. It should appear exactly the same as the upper text area, ie. font size, character baseline and horizontal advance should be the same.